One of the world’s oldest cuisines is that of Persia. And with the coming of the Persian New Year, or Norouz, on March 21, now is a good time to discover the rich flavors and scents from this part of the world. With stews perfumed with cinnamon, mint and pomegranate; tender grilled kebabs of chicken and lamb, and exotic fruits and vegetables, Persian cooking has one of the world’s oldest histories and greatly influenced cuisines as far away as India and Morocco. Norouz means “new day” in Farsi, language of Iran, which is present-day Persia. It begins on the first day of spring and is a two-week celebration of rebirth and renewal. Dating to pre-Islamic times, when much of the massive Persian Empire followed the religion of Zoroastrianism, Norouz today is the biggest holiday of the year in Iran. Schools and businesses are closed, and the most prosperous take their vacation or retreat to the countryside. In preparation, Iranians here and abroad start fresh by cleaning their homes and buying new clothes. Coins with “happy new year” on one side and the shape of Iran on the other decorate the house. Children receive money as gifts, too. “This year, my birthday is the last day of Norouz, on April 1,” said Iranian-born Samira Fathi of San Marcos, who is a student at Palomar College. “We always get money for the new year.” And it’s not pocket change, she said, but several hundred-dollar bills. Moini also remembers her father giving her and her siblings a few dollars as a blessing, she said. 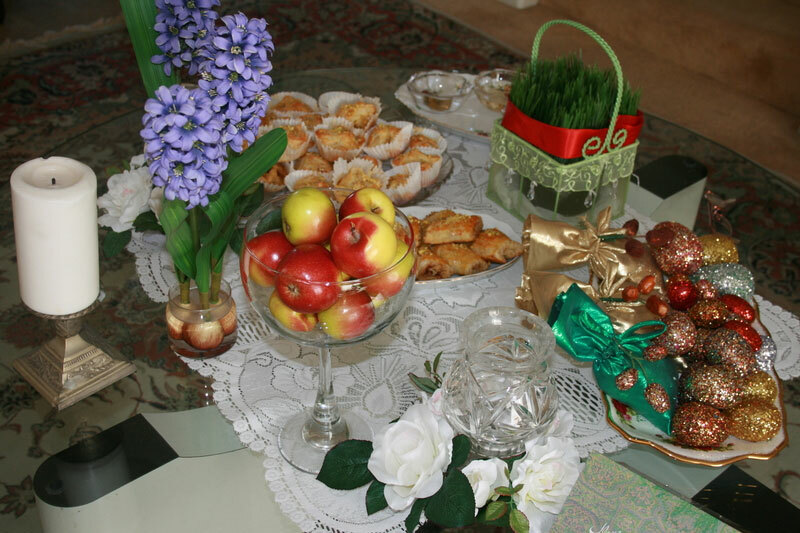 Foods served during Norouz communicate spring themes. Sweet and sour flavors are meant to represent the duality of good and evil. Eggs represent fertility, and are served in dishes like the popular kuku (similar to an Italian frittata). A warm noodle soup, ash reshfte, often starts the important meal. The noodles are said to represent wishes for the unraveling of life’s knotty problems. The main course for a typical Iranian New Year’s meal is sabzi polo hami, or green herbs and rice, served with a white fish sauteed with chopped onion, lemon juice, turmeric, salt and fresh garlic. “We have fish only on Norouz because my family doesn’t really like fish,” said Iranian-born Parvin Fathi, mother of Samira. Parvin and her husband, Naser, own Persepolis Market in San Marcos, which stocks many staple foods of Iran and the Middle East. Parvin pays great attention to her rice at every stage of preparation. First rinsed, then soaked overnight in warm, lightly salted water, the rice is cooked in a large pot of water, like pasta, and drained. Then freshly cut herbs are added. Presentation of the rice is important, too, said Parvin, and many Iranians serve it molded or layered with different colors from spices such as saffron and turmeric. Another important part of the dish is the tah dig, a crust that’s layered on the bottom of the rice pan before being covered with rice. It’s then cooked until the crust is golden brown. Made from yogurt and butter or simply a thin layer of bread, the tah dig is considered by many to be the tastiest part of the dish. It is so prized, in fact, it is often given to guests as a sign of hospitality. Parvin makes hers with pita bread or lavash bread and grapeseed oil. Originally from Azerbaijan, Parvin and her children came to America in 1995 to join Naser. He had left Iran in 1990 to find work here as a carpenter when the Iranian economy was devastated by the Iran-Iraq war. Though she said her mother was a wonderful cook, Parvin said she really learned to cook when she got married. Of course, there were a few setbacks along the way. Though she says she still forgets a pan on the stove occasionally, she says she loves cooking traditional Iranian dishes —- so much so that she and Naser plan to open a Persian restaurant alongside their market very soon, where Parvin will do the majority of the cooking. This week and next, the Fathis’ market on Rancho Santa Fe Road does a brisk business as local Iranian-Americans stock up on traditional foods for the holiday season. Today, a new shipment of chickpea sprouts will arrive from Los Angeles. When fully grown to about 4 inches and put in a basket or shaped in a form, they will make up a very important part of the celebration, the sabzeh. Tied with ribbon, the sabzeh symbolizes rebirth and is displayed on a ceremonial table until the 13th day of the holiday, when families picnic and take part in all sorts of outdoor activities. Traditionally, the best picnic spot is next to a stream or river, because the sabzeh should be thrown into a river or stream for good luck. During the holiday, besides the sabzeh, families display six other objects that symbolize spring and whose Persian names start with the letter S, including eggs, candles, flowers and treats of nuts and cookies. Persian holiday desserts are simple and feature a pudding called samanu made from the juice of wheat sprouts (like those used in the sabzeh), cooked for hours until it condenses into a naturally sweet substance thick enough to eat with a spoon. Also traditional are tiny chickpea-flour cookies shaped like four-petaled flowers and bite-size baklava in pistachio, walnut and almond varieties. Moini recalls a dessert pie, the crust of wheat flour and the center stuffed with walnut, date and cinnamon, that was a local specialty. “My mom made it especially for the holidays,” she recalled. During Norouz and throughout the year, Persian cooking is much more than kebabs and pita, though both of those dishes are popular too. Fresh herbs and spices give dishes a crisp, healthful flavor without being overpowering or too spicy, and careful preparation will ensure a successful New Year’s feast. Soak rice for a few hours or overnight in warm water and salt before cooking. Wash and drain the vegetables and herbs. Using a cutting board, repeatedly bunching up the vegetables, finely chop them. Fill a large (4-quart) pot three-quarters full with water. Bring to a boil. Add the strained rice. Let it cook for a few minutes until it starts boiling. Stir the rice a few times during the boiling process. Near the end of the boiling, add the freshly chopped vegetables. Stir the rice one last time, then drain it in a kitchen strainer. Wash out excess salt. Cover the bottom of the pan in cooking oil and make a flat layer of bread (pita or levash) on the bottom of the pan. Add rice mixture and pour clarified butter and grapeseed oil mixture over the rice. Cover and cook for a few minutes on high heat. When steam starts to rise, change the setting to medium heat and let it cook for another 15-20 minutes. Then turn the heat to medium law, sprinkling some more oil on the rice if needed to prevent drying, and let it cook for about another 10 to 15 minutes before serving. Serve crust separately or displayed with rice on serving platter. Serves 4. — Contact staff writer Ruth Marvin Webster at (760) 740-3527 or rwebster@nctimes.com.